Michaels Stores is North America’s largest specialty retailer of arts, crafts, framing, floral, wall décor, and seasonal merchandise for the hobbyist and do-it-yourself home decorator. Michaels is one of the funnest stores to visit for arts, crafts, framing, floral, home décor, scrapbooking and much more. Local area Michaels Stores are in Westlake Village at 5780 Lindero Canyon Road (818.707.0013), Camarillo at 351 Carmen Drive (805.388.5001) and Moorpark at 816 New Los Angeles Avenue (805.552.9140). 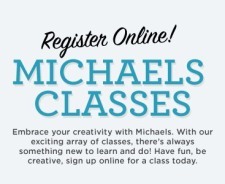 In addition to offering up tens of thousands of items for your arts and crafts needs, Michaels offers classes at very low prices! Classes cover a wide range of fun activities, including cake decorating, art painting, jewelry making, paper crafting, knit and crochet, kids' programs and more. For more information, visit www.michaels.com.